Laissez les bon temps rouler; let the good times roll! This mantra is at the very essence of our New Orleans Suite. There’s no place quite like NOLA, with its particular vernacular, rhythm and magic. As a place of diversity and a home of travelers, we thought it was only just to model one of our rooms after this ideology. Our New Orleans Suite is a visual delight with the Big Easy in mind. The bedroom features French Quarter themed walls, a king-size bed, and a view of our pond. Relax in the king-sized bed while enjoying the view of our beautiful pond. The Mardi Gras bathroom features a floor to ceiling walk-in shower with multiple shower fixtures. With the charm of the French Quarter, the colors and vibrancy of Mardi Gras, and the extravagance of New Orleans lux, this room will make you feel like you’re in the Big Easy. Come visit, and experience the joie de vivre for yourself! As my parents were able to stay in the New York room (and loved it), my hubby and I stayed in the New Orlean’s room. It is so beyond beautiful words can’t even describe! They go way above most AirBnb hosts we’ve stayed it. You can tell they genuinely care for their guests to have an amazing experience. I’ve stayed at many B&B’s, hotels and Airbnb’s and Bar Dew Inn has been hands down the best experience. Perry and Beth were such amazing hosts, and became good friends by the end of the weekend. They were so warm and welcoming, and went above and beyond to make sure our trip to Oklahoma was special. Their B&B is absolutely gorgeous, and so unique with each room being a different theme. The breakfast was delicious, and our stay at BarDew Inn was the best part of our trip. If you’re heading to Oklahoma, definitely stay here above anywhere else. Thanks so much for making our stay so special! 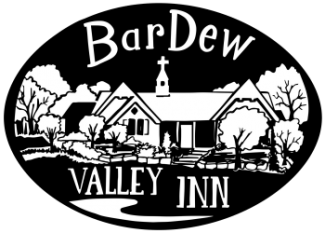 The BarDew Valley Inn is perfect for a stay near the Bartlesville area. It's gorgeous, quiet, and the hosts, Beth and Perry, couldn't be more accommodating. I've stayed in both the NYC and New Orleans rooms at the Inn. Each has its own individual charm besides being extremely comfortable and clean. Outside each room is a lovely patio, perfect for early morning coffee or evening relaxation. They serve a delicious Continental breakfast and are always available to point out local sites of interest. I have never stayed at a bed-and-breakfast before my wife has always wanted to would recommend this place to anyone they made you feel like you were at home. Loved the location and the rooms are so unique. Good breakfast and company. And we got there just in time to see all the pretty Christmas decorations.